Mother Teresa, born Agnes Gonxhe Bojaxhiu was a Catholic nun of Albanian ethnicity and Indian citizenship, who founded the Missionaries of Charity in Calcutta, India in 1950. At the age of eighteen she left her parental home in Skopje and joined the Sisters of Loreto, an Irish community of nuns with missions in India. From 1931 to 1948 Mother Teresa taught at St. Mary's High School in Calcutta. in 1948 she received permission from her superiors to leave the convent school and devote herself to working among the poorest in the slums of Calcutta. Although she had no funds, she depended on Divine Providence, and started an open-air school for slum children. Soon she was joined by voluntary helpers, and slowing started receiving financial support. This made it possible for her to extend the scope of her work. For over 45 years she ministered to the poor, sick, orphaned, and dying, while guiding the Missionaries of Charity's expansion, first throughout India and then in other countries. 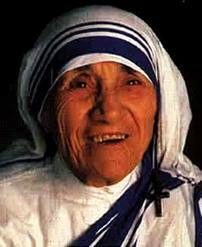 By the 1970s, she was internationally famed as a humanitarian and advocate for the poor and helpless. Mother Teresa won the Nobel Peace Prize in 1979 and also India's highest civilian honor, the Bharat Ratna, in 1980 for her humanitarian work. "Spread the love of God through your life but only use words when necessary." "Kindness is a language we all understand. Even the blind can see it and the deaf can hear it." "Let us not be satisfied with just giving money. Money is not enough, money can be got, but they need your hearts to love them. "If you are kind, people may accuse you of ulterior motives. Be kind anyway. If you find serenity and happiness, some may be jealous. Be happy anyway." the phone call we've waited for, the ride we are offered, the letter in the mail, just the little things He does for us throughout the day..."